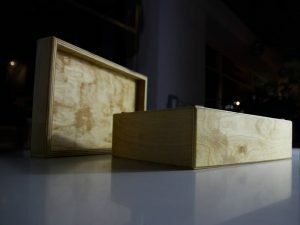 Learn how to make your own little plywood box. Ideal as a jewellery box! In the process, you’ll use a mitre saw, table saw, sander and other basic tools. As per usual, this workshop is intended for woodworking beginners and will focus on safety around power tools. We will assume you have never touch any of the tools before. Space is limited and our workshops sell out quickly! One plywood box/participant! Please note that boxes will be similar to the pictured boxes, but not identical. Must be at least 18 years old to attend.